Travel accessories are all the smaller conveniences a client or guest brings to help make their time away from home as comfortable as possible. However, often they forget to bring these essential items along on their journey because of busy and demanding lifestyles. 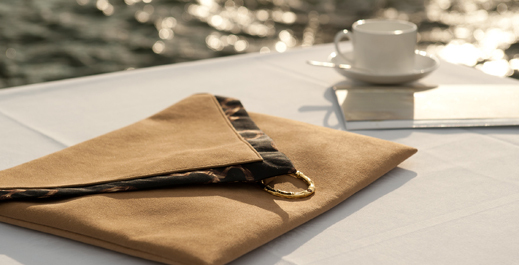 Our collection of travel accessories, including blanket carriers, personal valet trays, and handbags are designed and created to help you complete the travel needs of your valued guests and clients. Skilled artisans will craft each piece to your unique specifications including unique textile colour, the finest silks or organic cotton linings, gold accents and adornments in Swarovski® crystal. At Shelley Antecol our focus is to seamlessly bring ease to travel with style, beauty and elegance. Italian Alcantara® in beautiful colours or premium grade leather to create a gift of distinction and lasting luxury. Our creations will ensure your clients and guests feel well taken care of and appreciated. Enjoy the confidence of knowing that they will journey back home with a thoughtful and unique takeaway gift to remind them of your sincere hospitality. Elegant expressions of renewal for discerning guests and clients.